As concerns to giant stars to which are attributed the masses about ~ (108 109 ) M [27, p. 374], we would like to draw the Reader's attention to some features of such stars structure, which, in that number, we analysed in  and . In that work we showed, the nucleus of star where its main mass is concentrated takes a well less volume than the volume of its visible disk. From this, there follows that the conventional method to measure star masses through the size of visible disk is incorrect, as the diameter of shell varies and can be very different at different time. 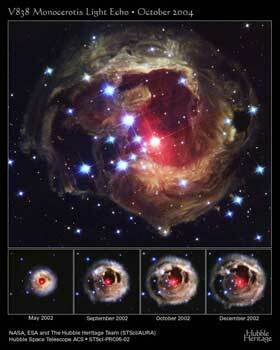 The evolution of the star V 836 Monocerotis can serve as the corroboration (see Fig. 8). 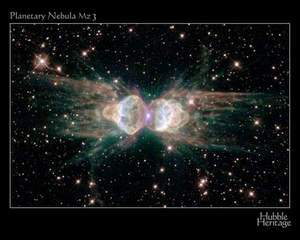 In the right image, bottom, we see the whole sequence, how the shell of this star evolved, beginning with the moment when it densely covered the nucleus of the star. And only due to fine resolution of the Hubble space telescope, we can see the nucleus in the centre of this globe. But generally the nucleus could be invisible at this stage, V 836 Monocerotis is a rare case where the polar area is turned to the Earth and allows our telescopes to see it. And the shell can evolve quite long time during which the shell will retain its continuity, despite it can expand by several orders. All this time we will observe the star as a giant, and only after it has finished its expansion, when the shell separates in layers and flows down to the equator, as in case of V 836 Monoceritis, we can see the nucleus itself. At the same time we can see a vast area between the nucleus and shell that is much larger that the nucleus. Thus, if we try to calculate the mass of celestial body, proceeding from the diameter of shell and relying on our approximate estimations of stellar density, by the analogy with the density of Sun, which is measured through the diameter of its visible disk, we will yield the masses more than those real by the same several orders, just as we see in literature and as Shklovsky gave above [27, p. 374]. But if we calculate the mass of nucleus, as is seen in case of V 836 Monoceritis, such mass will be quite comparable with that of Sun. The same story is with the temperature of a star. On the surface of expanded giant, we will measure the first thousands of degrees; on the chromoshpere of visible disk - the first dozens thousands of degrees; on the surface of 'white dwarf' which uncovers after the explosion we will measure hundreds thousands and even million of degrees of surface temperature. Today scientists make of it too far conclusions of extreme energy of some stars, while this is a simple lack of attention to the level of star structure, where the temperature is measured. And the fall of surface temperature with the age means not the cooling star but more effectively screened radiation of the nucleus. As well as high intensity of radiation after explosive uncovering of the shell does not mean a least that the star itself shrinks to 10 km in diameter and turns to the state of neutron star. The counter-pressure, which existed in the nucleus before the explosion, will effectively counteract such shrink. Simply after the explosion we see the unscreened radiation of the nucleus. At the same time, this feature does not mean that there in the universe are no objects with the mass which well exceeds that of Sun. Perhaps they exist, but the images of all known objects of such kind (see, e.g., Fig. 4) show that in better resolution they all appear to be the associations of discrete bodies and never are a single giant body. All our knowledge of such objects brings us to a thought that giant protogalactic clouds scatter in gravity compression into a multitude of discrete masses and form the galactic nucleus consisting of stars, but it never remains to be a single mass. Among tremendous number of known associations and galaxies no one has in its centre a trustworthily single superstar. But if speaking of black holes as if able to be produced in the celestial bodies that have 2- 3 Solar masses, we have to note the following. As we revealed it above, in accordance with relativistic calculations (after Oppenheimer), the nuclear 'fuel' has to 'burn out' before the free fall. With it the speed of free fall to the centre has to be close to that of light. But first, even if the 'fuel' 'burns out' (which is quite doubtful), this occurs not at the moment. And second, as we also said above, the stable evolution of star precedes the so-called free fall, which cannot provide the free fall of substance onto the centre, nothing to say of effective counter-pressure existing within the star. As an example of such kind of dying stars, we show in Fig. 9 two images of old stars. They have a very typical shape of stellar wind (typical just for dying stars) directed with equator and having an heterogeneous structure well seen in negatives (right images). 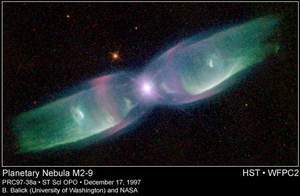 The shape of luminous halo in the positives is largely deformed, as it shows the distribution of the rest of shell located along the equator and excited by the stellar wind. Our Sun also has such structure of stellar wind, which we showed in . But in the images we see no precursors that the substance of these stars falls onto the centre with the speed of light. In accordance with relativistic calculations, this is possible only at zero pressure within the star, - while we showed, this is basically impossible.